Why is it called the "Absolutely Impossible" Wallet? Simple: To anyone who sees it performed, it really appears to be quite impossible! Here is exactly what happens: The magician removes his wallet from his pocket, opens it and removes an envelope, which is sealed. The spectator is asked to sign his name across the sealed flap of the envelope. The envelope is now replaced into the wallet which is set aside in full view on the table...it never leaves their sight! A deck of cards is now handed to the spectator with the request that he shuffle them thoroughly. This done, the deck is spread across the table and the spectator is asked to push ANY card out of the spread. Please note - The selection is absolutely, positively NOT forced in ANY WAY WHATSOEVER. The wallet is now opened and the envelope is removed. The spectator himself may open the envelope! Inside he finds a single card with a different-colored back than those being used. 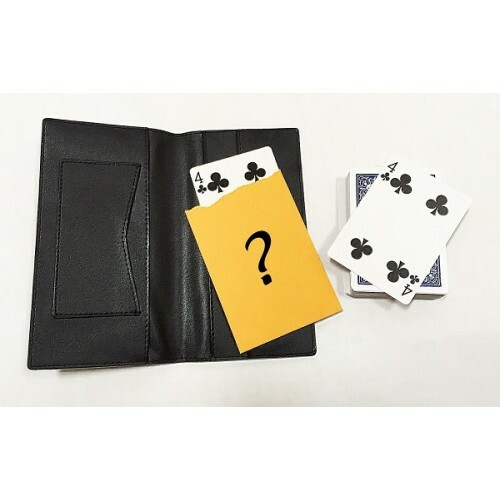 When the freely selected card is turned face-up by the spectator himself, he is absolutely STUNNED to find that it matches the single card he found in the envelope! Please remember: ANY deck may be used. Only ONE envelope is used. The envelope is NOT gaffed in any way. Everything takes place before the eyes of the audience. There is NO palming of sleight of hand involved! 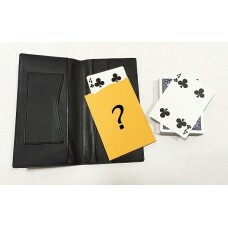 The wallet is high quality leather and may be used as your regular wallet when not performing this effect. I managed to pick up just a few of these when in Europe some time ago. They come with the original instructions (from Austria) written in the English language. When these are gone, that's IT. No more.